This guy’s name is Jasper. He is a super handsome and very sweet boy. He was a well loved guy that, due to circumstances, his owner surrendered him. We do our best in these situations, but we are generally so full with “dumped” or abandoned rabbits we often have no space left. He came to us with a very distended abdomen. 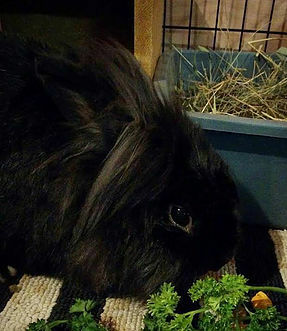 He was eating good and behaving normally, but he was larger than he should be for a healthy bunny. We monitored him closely and put him on a strict diet and weighed him after two weeks. Somehow, he had gained weight. 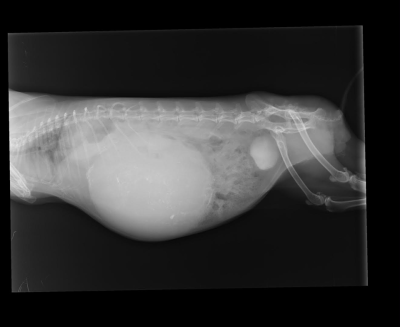 So I took him into the vet yesterday and we started by doing an x-ray. I warn you … this x-ray is very upsetting. We were all shocked at what we were seeing. There is a HUGE mass in his abdomen. 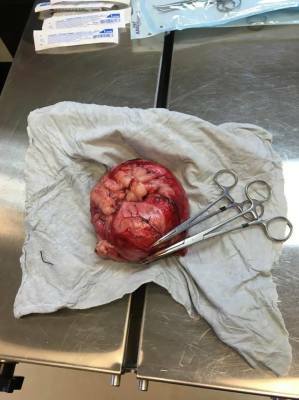 So, Dr Collard, at Cobequid Animal Hospital, decided to do an exploratory surgery to see what we could do. None of us were very optimistic. Nobody had seen anything quite like this in a rabbit, but we had to take a look inside and see what it was and if we could even help. The mass was so large it filled his entire abdomen - pushing his organs out of the way. Dr Collard slowly and carefully removed the mass! Jasper weighed about 3lbs before his surgery and the mass (once removed) weighed 1.65lbs - more than half of his 3lb weight! He sutured him up and we are hopeful he will make a full recovery … but … he isn’t out of the woods yet. Rabbits don’t do well under anesthetic and it takes a real toll on them. The next few days will be crucial. Making sure he can start to eat again and tht the massive surgical area heals. This morning, he was resting comfortably at the rescue. He is very lucky that Dr Collard was able to remove it. We have sent it away so we can find out exactly what it is and what the outcome will be. We thought we would share this with everyone. We will keep you updated on his progress. Please send him some healing wishes. He is such a great guy. He (and others like him) are why we are always fundraising. He is moving around, slowly, but is bright and alert. He is eating very little, but that is to be expected. He has had some veggies and some hay and is pooping, so that is fabulous! His poor little body has to shift everything around to fill up that space. So far, so good! He is on pain medication and fluids when needed. Keep the good vibes coming everyone! Update March 26 … Jasper is doing great so far. Eating lots and drinking some. Not the best drinker or hay eater but we are working on that. He is pooping lots and they look great. Thank you for all your prayers for him. It is amazing that he made it through this. The results came back. They determined it was most likely an abscess and a very necrotic gallbladder. The gallbladder is gone so hopefully happy days ahead. 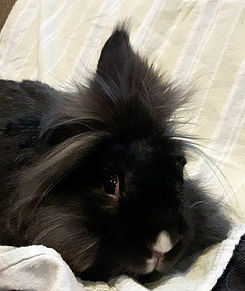 So as we all know Jasper has come so far from the bunny that came into the rescue, and he is doing awesome in his recovery. Not sure if you noticed or not but in his x-rays of his tumor there was another white spot and if you were wondering what it was, the answer, is ... "sludge". It's a calcium deposit that is a very thick olive green liquid, it's usually passed when a rabbit is active, but Mr. Jasper wasn't so active and it settled in his bladder! massaging his bladder and taking him to the yard in hopes that it would make him more active! And guess what - it worked! !He has come out of his shell and spends a lot of time binking around the yard. Hopefully in a few weeks we can check to see if the sludge is gone or not, and give him an A+ on his vet check-up!